Today we announced Mozilla’s Open Badge Infrastructure project, an effort to make it easy to issue and share digital learning badges across the web. Open Badges is a response to this trend: an open specification and APIs that provide any organization the basic building blocks they need to offer badges in a standard, interoperable manner. If we’re successful, the benefits to learners will be tremendous. Open Badges will let you gather badges from any site on the internet, combining them into a story about what you know and what you’ve achieved. There is a real chance to create learning that works more like the web. Also, this sort of badge collection may eventually become a central part of online reputation, helping you get a job, find collaborators and build prestige. This is another reason Mozilla wants to build an open badge format: it can show the real potential of open identity tools on the web. Released today, the first Open Badges beta was developed by Brian Brennan and Erin Knight, with support from Dan Mills and Ben Adida in Mozilla Labs. It includes a badge format spec, APIs and reference implementation for ‘badge backpack’ software. It also builds on other Mozilla open identity technology like Browser ID. Our first implementation will be as part of School of Webcraft, an initiative Mozilla runs jointly with P2PU. Today’s announcement coincides with the launch of a $2 million badges for learning competition funded by MacArthur Foundation and run by HASTAC. Earlier this week, MacArthur approved a $1 million grant to Mozilla to work on the Open Badges Infrastructure, a platform that will be used by all winners of the competition. US Secretary of Education Arne Duncan, MacArthur Foundation VP Programs Julia Stasch and Mozilla Executive Director Mark Surman spoke at the competition launch in Washington DC earlier today. Here is the MacArthur Foundation press release. Lookout InterWebs: Army of Awesome is here. 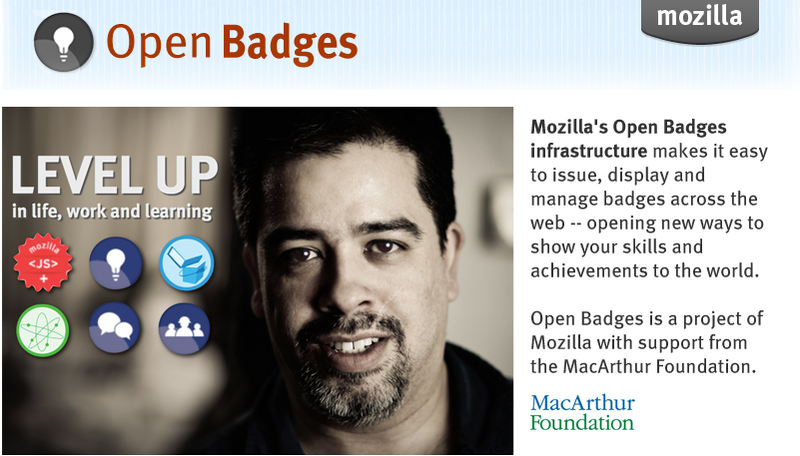 You are currently reading Mozilla Launches Open Badges Project at commonspace.